When I was a child, I had a private, heart-shaped diary. At least I thought it was private because it closed with a padlock and key. Never mind that the lock was attached to a plastic strap susceptible to scissors. I’m sure I would laugh at what I wrote between the covers of that little book were I to find it today. But at the time, my 11-year-old heart believed it was a treasure worth hiding in a secret place. So I buried it out by the hay stack not far from our corral. Confidences have long been kept, and over the centuries, one man or woman’s determination to keep a secret well-hidden has become another’s motivation for uncovering it. When it comes to hiding things rather than thoughts, inventive artisans have crafted clever means of concealing items of importance and/or value. I am most fascinated by secret drawers and compartments, even rooms. A friend of mine built an undetectable room into the second floor of her Kentucky home. As close as we are, I didn’t know it was there until she told me. Like the entrance to a tunnel or hiding place in an old mystery movie, a small bookcase in an upstairs bedroom opens into my friend’s unexpected space. Knowing secrets can make us feel important, while keeping a secret may also keep us up at night worrying about who may find out. 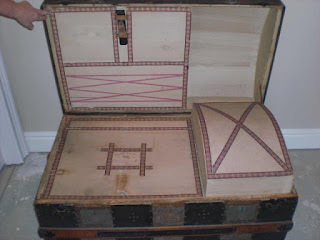 Such was the premise behind a trunk with a false bottom belonging to Elizabeth Beaumont, the heroine of my recent novel. Like me, she kept a journal. Not only did she record the recipients of unusual letters she wrote for her nefarious employer, she kept the journal hidden beneath the false bottom of her trunk. 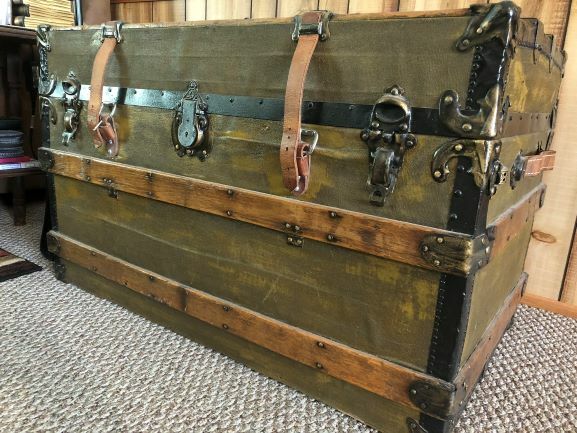 Victorian-era trunks differed from chests due to their reinforcements for travel, such as leather straps, wooden slats or bands, metal-covered corners, and brads and locks. The original box typically consisted of pine, covered with protective layers of leather, canvas, paper, or tin, followed by wooden and/or metal staves. 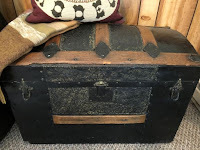 Pre-1880s wardrobe and Saratoga trunks were famous for their various compartments and trays used for safe storage of coins, documents, hats, parasols, and other personal items. Many of these trunks also boasted secret compartments. I like to think that in 1881, Elizabeth Beaumont would have had a Saratoga trunk complete with drawers and trays serving organizational purposes, as well as at least one secret compartment. Many different manufacturers, including furniture makers, built trunks. One of hundreds in the United States was Shwayder Trunk Company from Denver, Colorado, (1910) whose product eventually came to be known as Samsonite. 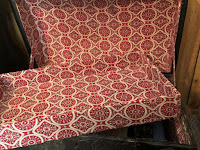 Another well-known malletier (trunk maker) was Louis Vuitton who began his craft in the 1850s in France. The company bearing his name is still making luggage today. 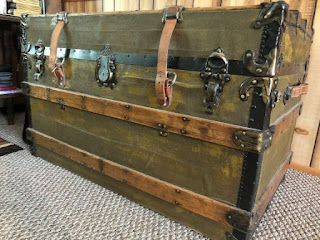 I have two refurbished trunks, one a packer or flat-top covered with painted canvas. Popular in the late 1870s through the 1920s, such trunks have often been called steamer trunks. However, true steamers kept in state rooms on long voyages were about 14” high for storage purposes. My trunk comes in at 23” and would not have been kept in a passenger compartment. My dome-top trunk also dates from the 1880s and is covered with embossed tin. 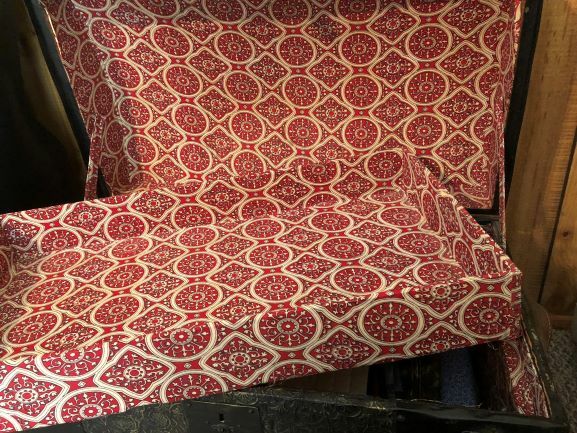 Its interior has been covered with fabric. So has a large tray that rests in the top of the trunk. Both trunks are reinforced with wooden slats, metal hardware, and leather handles. In addition to my trunks, I have gathered countless journals—my own. Over the years, I’ve continued to write out my thoughts and prayers and wishes. The secrets held by those journals may not be as important as those kept by Elizabeth Beaumont, but the act of writing—long hand—has seen me through challenging times as well as momentous and joyous occasions. Someday my children may read those journals and be surprised to see how many prayers I penned on their behalf. Do you have secret hiding places in your home? (Don’t reveal them here – a simple yes or no will do!) Are you a journal keeper? I’d love to hear if you have items or information important enough that you have endeavored to keep them safe, secure, and secret. Wife and mother of professional rodeo bullfighters, Davalynn Spencer writes Western romance. She is a Publisher's Weekly bestselling author and won the Will Rogers Medallion for Inspirational Western Fiction. Connect with her at https://www.davalynnspencer.com/. Desperate to redeem her reputation and independence, runaway Betsy Parker returns home to face her toughest critics—the people she grew up with, a rugged lawman who threatens to steal her heart, and the one person unwilling to forgive her. I used to keep journals. I'm not exactly sure why I stopped. I also have in the past kept sort of a spiritual journal, recording what I read each day and prayers resulting from the passage or about the challenge the Scripture presented. I should get back to that, I'm just not sure I want anyone else to read them. Connie - I understand. Some discoveries are for only our personal benefit. But oh what a treasure they are. When I get a few extra dollars, I hide it somewhere in my bedroom. It came in real handy when we had a horrible ice storm and most of the city was without power. You could only buy things with cash--providing you could even get to the store. I've told my kids to not throw anything out after I die without looking in it. They just might find a small treasure. Oh, Vickie, such great advice for your children! Hopefully they will learn from your wisdom and have on hand what they need. I do the same as you, and my parents did before me. There's something to be said for "change in the sofa."